Watch movies the way the director intended. Panasonic TVs are used by experts to “colour grade” Hollywood films before they are released. High Dynamic Range (HDR) technology lets you see picture with more contrast and brightness, so you can enjoy unparalleled picture and sound quality in your own living room. 4K Ultra HD screens deliver four times as much detail as an HD screen. The Panasonic Hollywood Laboratory (PHL) was set up more than 20 years ago to forge closer ties with movie industry creatives. The PHL has worked with professionals from every part of the movie world to gain a better understanding of what goes into creating a film, and what those professionals want from a video display. All this knowledge has gone directly into Panasonic displays and televisions, which now contain premium technologies which were once reserved for professional monitors only. Since 2017, Panasonic has been working closely with Deluxe to ensure their award-winning OLED TVs can match the filmmakers’ vision, so they are a common site in film studios. Top colourists, image scientists, and engineers at Deluxe and other post production companies also helped to tune and test the 4K Pro FZ952 and FZ802 models. High-end Panasonic 4K PRO TVs are designed from the bottom up and tuned in Hollywood to deliver picture quality accurate to the filmmaker's original intentions. Equipped with both cutting-edge Panasonic 4K Studio Colour HCX2 Processor with professional-quality colour management technology and the OLED next generation panel, 4K PRO TVs capture every nuance and detail of the original film. Tuned by professional Hollywood Colourist to achieve picture quality as the director’s intention. The OLED panel is a self-illuminating system that doesn’t require any additional light source, such as backlight. When electrical current flows to the organic layer light-emitting element, the panel is illuminated. Ultra HD Premium is a standard put together by the UHD Alliance, a cross-industry body composed of the leading film studios, consumer electronics manufacturers, technology companies and content distributors, with Panasonic as one of its board members. The UHD Premium Certification* is only given to products which have passed the performance criteria related to resolution, dynamic range, and colour spectrum, amongst others. The new Studio Colour HCX2 4K processor represents the pinnacle of Panasonic image processing. 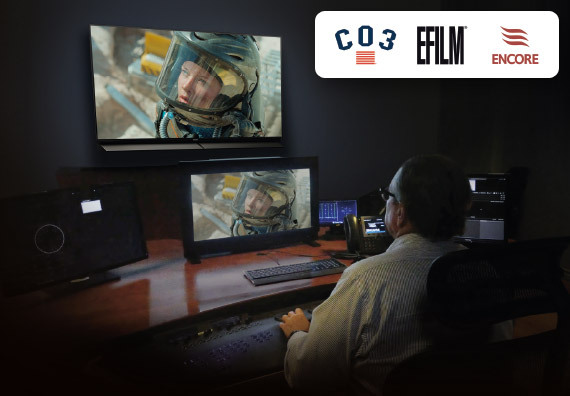 Built on colour, black level and brightness know-how learned from our reference-quality plasma TVs and professional broadcast equipment, the system has also been tuned by a Hollywood colourist to deliver picture quality true to the filmmakers’ vision. With Panasonic panels featuring THX 4K Display, you can be sure of experiencing the original image quality of a movie just as the filmmakers intended – in spectacular 4K. These Panasonic TVs have cleared the high standards for 4K set by the THXR Certified Display Programme. Panasonic's high-end 4K PRO HDR TVs are designed from the bottom up and tuned in Hollywood to deliver picture quality true to the filmmakers' vision. Equipped with Panasonic's cutting-edge Studio Colour HCX2 processor with professional 3D look-up table colour management technology and the OLED next-generation panel, 4K PRO HDR TVs capture every nuance and detail of the original film. 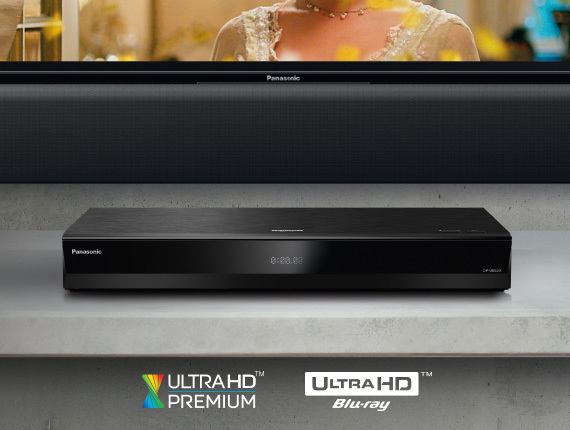 Enter a new world of picture and sound quality with Panasonic’s Ultra HD Blu-ray Players. To get the very best from its 4K TVs, Panasonic has created a range of 4K Ultra HD Blu-ray players new for 2018. They all feature Ultra HD Premium Certified picture quality, which earned the flagship DMP-UB900 fantastic reviews. 4K Ultra HD Blu-ray disc media doesn’t just give you amazing resolution. It also uses High Dynamic Range (HDR) to show picture that is brighter, more colourful, and has greater contrast. This means images look closer than ever to cinema-quality, and as close as possible to the director’s intention. With a 4K Ultra HD TV, you can be sure you’ll always get the best possible picture. You’ll see more detail in dark scenes and subtle shades that will make everything look more realistic than ever. A 4K UHD Blu-ray player will upscale and give a new lease of life to your existing DVD and Blu-ray collection, but with a 4K Ultra HD Blu-ray disc you can unleash the full potential of your TV, and enjoy better image than from any other source. Some Panasonic TV’s, like the flagship FZ952 Series, already come with impressive off-board speakers that will draw you in to the film for a cinema-like experience. 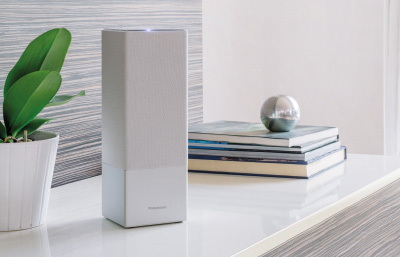 If you want that same unparalleled experience with other models, you may want to consider a soundbar. 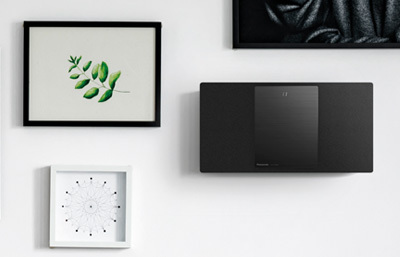 Some come with a sub-woofer that will add deep rumbling bass and bring action movies to life. 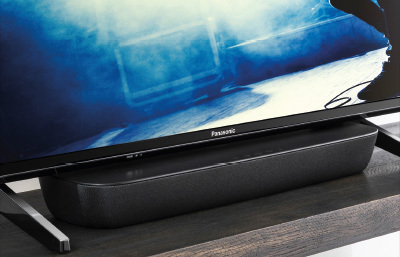 Panasonic’s new compact soundbars are designed to fit between the feet of the FX700 and 600 Series, so you can get amazing sound without sacrificing space.